The Marketing Metrics Training Series is an initiative from the team at Marketing Matters which aims at exploring the different systems of measurements in the world of marketing. Therefore, the benefits of this training series are two-fold as it not only helps us to improve our knowledge base and quality of our services but it also allows us to enrich the knowledge base of our clients. The training series and all the material has been referenced from the book, “Marketing Metrics: 50+ Metrics Every Executive Should Master” by Farris, PW, Bendle, NT, Pfeifer, PE and Reibstein, DJ. The methods of training are presented in both video and PowerPoint presentation formats which represent the summaries of each chapter of the above mentioned book. The videos are basic, one-on-one type lectures which have been filmed to enhance the content of the presentations. The videos can be found on our YouTube page (www.youtube.com/mattersmarketing) while the presentations can be found on our Slide Share page (www.slideshare.net/Marketing_Matters). The individual links may also be found on our website. The presentations are available for download in the form of PDF’s and PowerPoint presentations (on our Slide Share page). 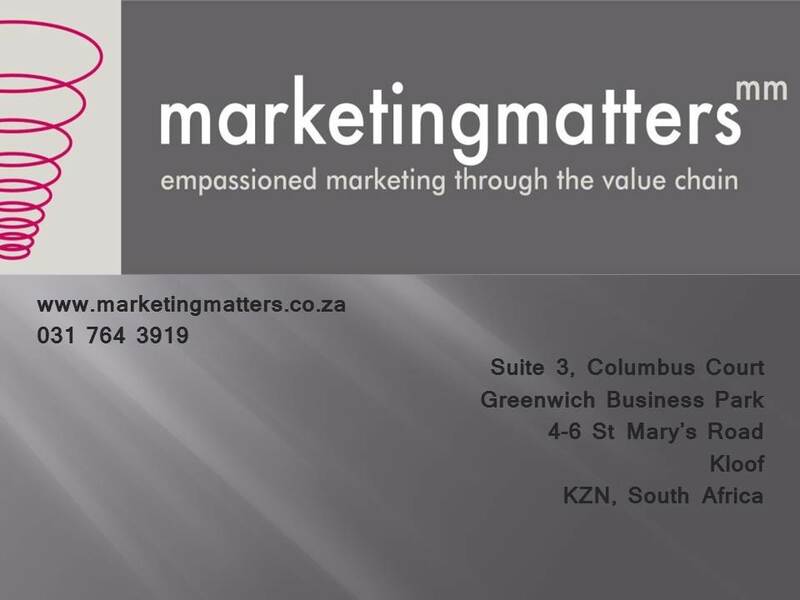 For more information regarding the training series or if you would like to find out a bit more about Marketing Matters, please find our details below.